The financial consequences of late-life unemployment are steep. The typical older household’s income drops 42 percent after one of its members leaves a job prematurely. Even if they find a new job, they usually can’t recover all of the lost income. Some older workers resort to using retirement savings to pay their routine expenses, and the greatest financial hardship falls on black and Hispanic Americans. The incidence of forced retirements persisted even after the economy rebounded from the 2008-2009 recession. Among the recent retirees in the study, about four in 10 said they felt effectively forced to retire prematurely. Sometimes the retirement grew out of health or personal issues such as caregiving duties but many workers felt their employers pressured them to leave. 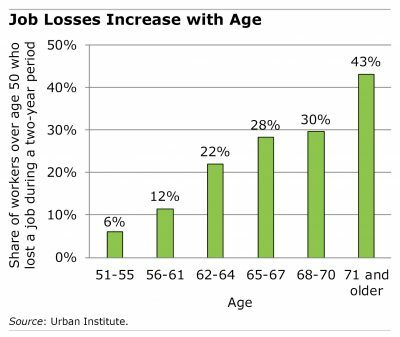 As people age, they become increasingly vulnerable to losing a job. The researchers took a snapshot of a two-year period and found that 6 percent of workers in their early 50s had a bout of unemployment during that short time. This rises to nearly 30 percent when people hit their mid-60s. While the research on age discrimination is inconclusive, it clearly is on older workers’ minds. A majority of older workers in this study reported feeling discriminated against at work or observing it among older coworkers. Other studies have shown that age discrimination is one reason they have more difficulty finding a new job. Age discrimination affects women more than men, and a college education provides very little protection against layoffs, according to the study. Involuntary job losses cut across industries and are prevalent all over the country, especially in the region that spans Alabama, Kentucky, Mississippi and Tennessee. Nearly two in three workers over 50 living in that area either lost a job or were encouraged by their employer to quit. Unemployment late in one’s career is particularly bad timing. Older workers, who are preparing themselves and their finances for retirement, will have little time to adjust their plans if they lose their jobs. 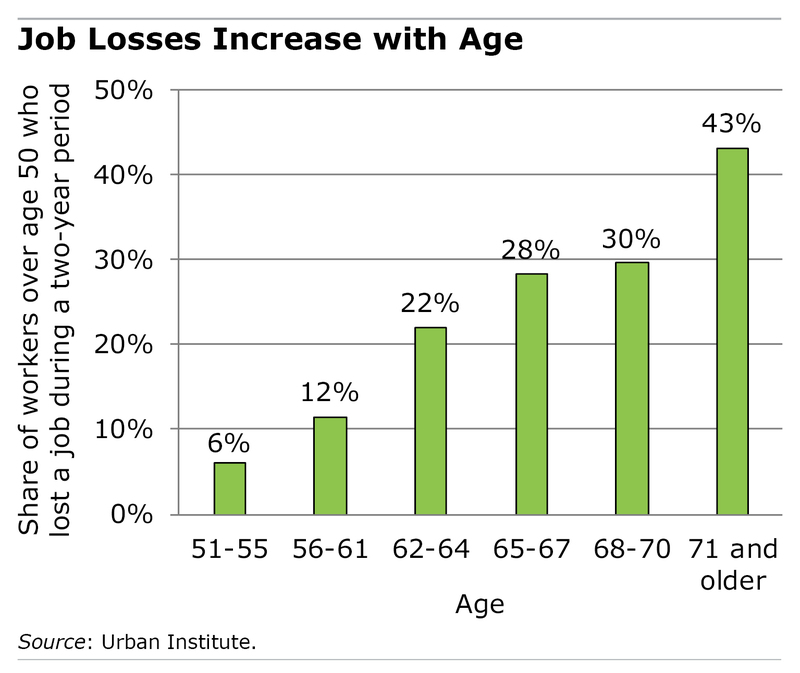 Job loss will increase as people get older and decide to leave the workforce (by retiring). Does the chart above only count those who lost jobs against their will (layoffs/downsizing, discrimination,etc) or just every single job loss no matter who facilitated it? In other words, sometimes they are laid off but sometimes they decide to leave, though they do so under duress. In 1998 at the tender age of 53, my job, and the jobs of four others who had the same position, was eliminated. The company had a good severance package that included training by an outplacement company. When I signed for the severance, I agreed not sue the company for any reason including age discrimination. Eventually I found full-time employment in 2001 at a salary 70% of what I had been earning in 1998. Over those three years I had several part-time jobs and one gig as a consultant that turned into a part-time job. Three of the four people terminated with me in 1998 were also male and in their mid-fifties. Not surprised to hear that age/gender discrimination is still alive in the business world. I suspect that it it will end someday, when companies no longer have pension obligations that affect the bottom line. I wonder how the private sector compares to the public sector? I’ve seen far too many people in their fifties who were going along nicely, getting good performance reviews, etc., who were suddenly told their performance was poor, they were called on the carpet for an absence due to illness, or some other excuse. They were then let go, demoted, or pressured in some way to leave. In one case, the supervisor repeatedly asked “for planning purposes” when an older lady was planning to retire, though she had no intention of doing so. In another, a gentleman was fired one month after he became vested in the pension–he believed that he had been allowed to stay long enough so he could not claim that as a reason for letting him go–though he was only in his early 50s. They all knew they were replaced by someone younger and lower-paid. Often, the person letting them go was a new, younger manager, too. After 55 your productivity begins to fall, slowly. It doesn’t drop to zero, and neither should one’s pay. But workers may not accept not getting raises anymore, and employers may not be willing to accommodate those who are slowing down. That needs to change. And health insurance. Having lots of 55 to 64 year olds increases what an employer is charged. But that changes after 65. The labor force participation of those 65 and over is going up. Not much for those 55 to 64. You are incorrect about the productivity statement. Numerous studies have demonstrated no perceptible fall-off in productivity – as experience counters any cognitive decline. The neuroscience calls this “gist thinking,” the ability to get to the heart of an issue because one has solutions, practices, and resources hard-wired after years of doing it. I would argue that the advantages of keeping older workers, and incentivizing them to step up and contribute their experience and wisdom, represent an economic driver, not a liability. I was laid off at 53 from my job at the same company for 14 years. I was told my post was being eliminated. Had a few short stints at a few places for much lower salaries. Started an e-commerce business, but still trying to figure out what to do with my life. Was consumed by major depression and anxiety for much of the time after I was let go, try making decisions when you are depressed and lost confidence. Not a pretty situation to find yourself in at 55. This is very true among public school teachers, especially in urban areas (I taught in Boston) where punitive so called “education reform” laws have been passed to supersede collective bargaining agreements. I taught in a high needs school for 7 years. I was not rehired at the school when the district took it over because of low test scores despite having proficient ratings as a teacher and a Masters from the Harvard Graduate School of Education. I was forced to apply for jobs in other schools. But at 64 years of age I was passed over for younger teachers. One school even asked me how much longer I was going to work. Because I had seniority I could not be dismissed. But each year I would be moved to a different school. I retired after one year, 2 years earlier than I had planned. I was lucky. There are teachers in their 50s who are NOT close to retirement who are in similar positions, having to make the stressful move to a new school each year because of the biases principals, especially the young ones, have against veteran teachers. There’s nothing but bad news here, unfortunately. I’ve been laid off and can keep afloat for the time being. I’m starting a serious job search, and have a coach (paid for by my former employer) to assist with that. I’ve read articles that state that there are jobs for seniors, and some places value them, so I hope that’s not a complete fantasy. This country has a lot to be ashamed of regarding treatment of seniors, notwithstanding Social Security and Medicare. Thank goodness at least we have that. But we ought to be valued, not trashed.